Thirty minutes was not enough to talk in any detail about any of the ten, but I hope it gave the listeners a nice taster of the fascinating characters whom we write about in each chapter. The book has been available since early December. You can order a copy by following this link if you are in the UK, and this link if you are in the US. I am currently in Namibia (see my blog from Tuesday), and recorded the interview in the few days between getting back from a 3-week trip to the USA and leaving to give talks on a cruise in South America. 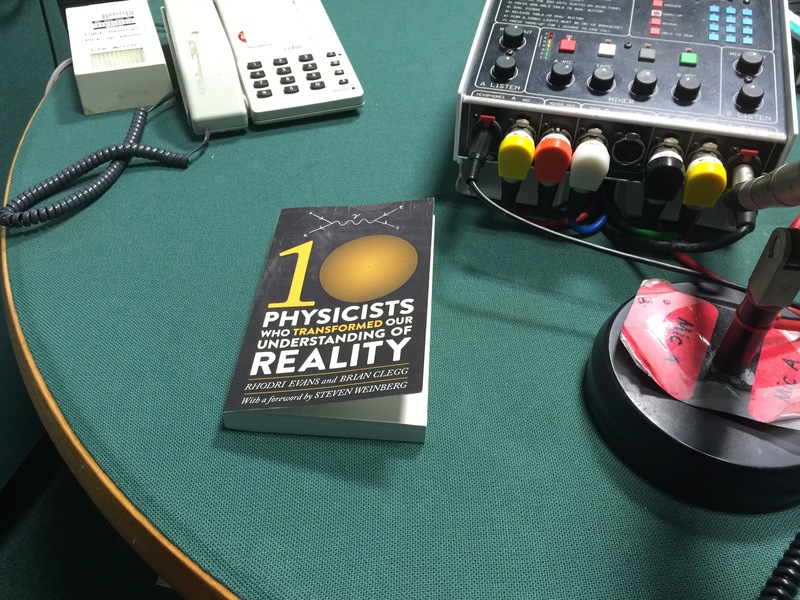 The broadcast of the interview was delayed a little as Science Cafe had recently done a programme about antimatter, and as Paul Dirac is one of the physicists in the list the producers decided to leave a few weeks pass before its broadcast. Last night (Wednesday the 2nd of March) I gave a talk about ‘the oldest light in the Universe’ (the Cosmic Microwave Background – the subject of another of my books) to the Swakopmund Scientific Society here in Swakopmund (Namibia). I will give a summary of that talk next week when I am back in Cardiff. 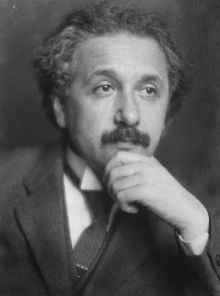 You can also find out more about 10 Physicists Who Transformed Our Understanding of the Universe by following this link. Although I will restate it on Thursday, I am not going to be able to post the last part of my series about the derivation of Planck’s radiation law this week as planned. It is taking me too much time, and so I will post it instead on Thursday the 17th. It is nearly finished; honest! One of the reasons I don’t have as much time to write it as I would wish is that I am writing articles for a book called ’30-second Einstein’, which Ivy Press will be publishing next year (2016). The book is part of their series of ’30-second + subject’, and I have already contributed to their ’30-second physics’ volume, which is due out in March of 2016. For more information about the articles I wrote for ’30-second Physics’, follow this link. As with ’30-second Physics’; ’30-second Einstein’ is being edited by Brian Clegg, and I am writing 16 of the 50-odd articles which will appear in the book. There are about five or six of us contributing to the book. The concept of the books is quite interesting; each topic needs to be explained in about 300 words, which believe me is quite a challenge. This is sufficiently few words that every one counts, and usually I find my initial draft(s) are 450 words or more, so then I have to edit them down making sure I don’t lose the explanation in the process. Anyway, look out for this book in the next year or so, as soon as it is available I will post a link to it on this blog. In the meantime, check out the other books in the ’30-second’ series (there is a link to the series on this page), I haven’t contributed to any of them but many of them look interesting (and I have downloaded a few and enjoyed them greatly). at the National Museum of Wales in Cardiff. The lecture was given by Mark McCaughrean, who is senior science advisor at the European Space Agency (ESA) and, if I’m correct, also either heads up or is very senior in their public outreach efforts. 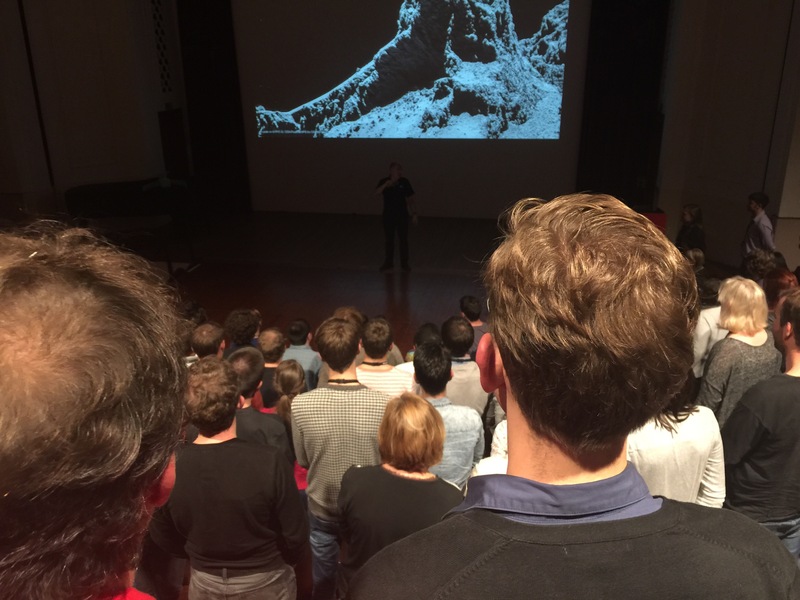 It was one of the best public lectures I’ve ever attended, and in writing that statement I am trying to figure out how many public lectures I have actually attended. 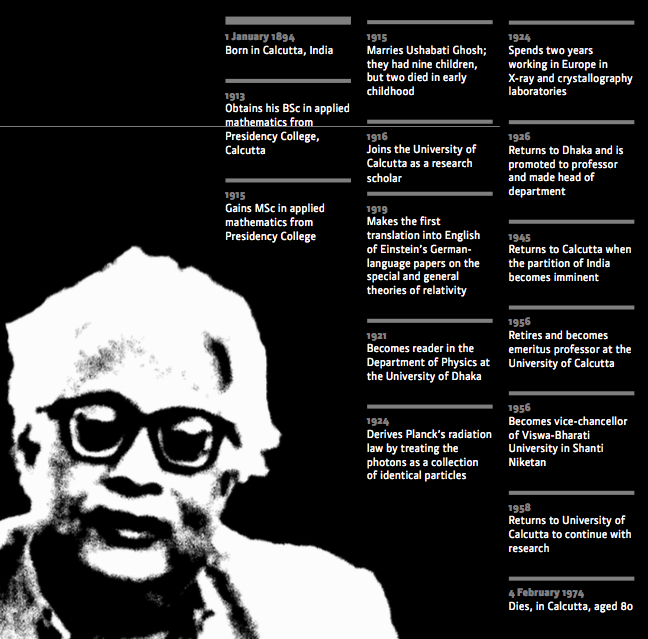 In addition to having given probably over 100 public lectures myself, I have probably attended some 150-200 public lectures given by others in the last 40-odd years. 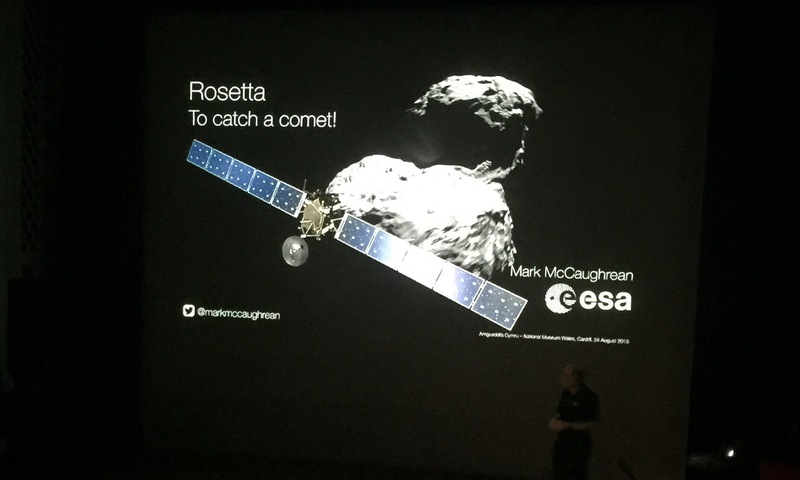 In addition to learning a lot about the Rosetta mission (I will blog about some of what I learnt next week), the lecture got me thinking about what makes a good public lecture. I have also been thinking about this the last few days because my book on the Cosmic Microwave Background has been reviewed by Physics World (the magazine of the Institute of Physics), and that review will apparently appear in their October magazine. But, the reviewer shared with me some of her observations about the book, and one point she raised is that she felt I was inconsistent in my level of explanations in the book. What she meant was that there are some things I explain so that complete novices can follow my arguments, but other things where more of a physics/astronomy background would be necessary to follow that I am saying. This is a valid point, and it shows the quandary I was in when trying to decide at what level to pitch the book. My primary audience was that I hoped the book will be used by undergraduates in the Disunited Kingdom and graduate students in the United States as a background text to any course they may be doing on the early Universe. But, in the back of my mind, I also had the interested lay-reader in mind, which is why I explained some things at a level for them. What I probably ended up doing was falling between two stools, and that is not always good in communicating science to the public. Last night’s lecture by Mark did a wonderful job, as it seemed to me that he was able to keep it at a level that (hopefully) everyone could understand, but at the same time there was some specialist information in there for professional astronomers to give them (and me) the impression that we too had learnt something. This is a difficult tightrope to walk, but Mark did it very well. This is what I try to do in my own public lectures, but I doubt I do it as well as Mark did last night. Whether I’m talking to school groups, astronomical societies, on the radio or TV or lecturing on a cruise, I always try to make sure that I don’t lose any of my audience in the first three quarters or so of the lecture by keeping things as simple as possible. At the same time, I always try to make sure that there is some information in the lecture (maybe some 25% of it) which will be news to even a professional in the field, as even in a public lecture you may have professionals in the audience. This was the case, for example, in lectures I gave on the cruise I did in South America in March – one of my regular attendees had worked at NASA JPL and he and I would have long chats after each lecture where he would quiz me further, or impart some information that I did not know about. Last night, Mark had a perfect mixture of videos, cartoons, animations, humour and exciting information, and it was all delivered in a relaxed and humorous way. As I say, one of the best public lectures I have ever attended. Last night the BBC showed a programme on the faster than light neutrino experiment which has made the physics world go into overdrive in the past few weeks. If you haven’t see the programme, it is available on iPlayer here. I don’t see any bits of it on YouTube yet, but keep a look out for it as, I realise, only people within the Disunited Kingdom can watch programmes via the iPlayer. The programme was presented by the mathematician Marcus du Sautoy, whom I have seen present some excellent programmes on mathematics in the past. As a physicist/astrophysicst, I appreciate the fact that du Sautoy said right up front that he was not a physicist. I am curious why the BBC chose du Sautoy instead of e.g. the darling of the media at the moment Brian Cox, but then again maybe the BBC feel BC is suffering from over exposure. I put a post on FaceBook alerting people to the programme going out at 9pm last night, and a colleague of mine commented “Gosh. So they can make science tv progs quick when they need to!” (I’ll excuse her poor grammar, this time 🙂 ). Indeed, it is amazing how quickly the BBC have put the programme together. And, considering how quickly it has been put together, I thought it was excellent. Maybe du Sautoy and the film crew were able to send their finished product from 2 years in the future back in time by using faster than light neutrinos to bring the video to October 2011! I wanted to go into a lot more details about this programme, but I don’t have time today. I will be returning to the topic of relativity in the near future – I am in the process of writing some lectures on the whole historical development of relativity, from Galileo through to Einstein, so will post bits of that story on this blog over the next few weeks.